The high cliff that tower over this beach also make access to it quite difficult. 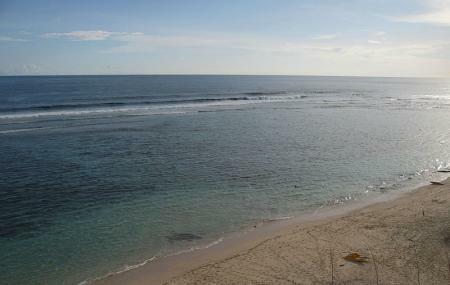 On the upside, that means this is one of the most untouched beaches you’ll find on this side of Bali. There are two halves to Nyang-Nyang beach, divided by a large headland. If you like shipwrecks you should have definitely had to down to the eastern half of the beach, where on the western end you will find an old shipwreck in the sand. You even have the option of camping overnight at the beach. The surf is very strong though, and recommended only for advanced surfers. For the same reason, swimming more than a little way out is not recommended at all. There is something mystical about the sunset here. It’s quite possible you’ll be the only person on the beach. For the east half of the beach, Drive to Villa Plenilunio, park, and then, trek some 500 stairs and over moderately undeveloped trail to get to the beach. For the west half, drive to Sanctus Villa and find the stairs nearby. How popular is Nyang Nyang Beach? People normally club together Berawa Beach and Petitenget Beach while planning their visit to Nyang Nyang Beach. Wow. Beautiful blue waters and sand is picturesque. Beautiful beach in Bali. It's beautiful to hunting the sunset in here. You have to go down to reach this beach. And if you are about to go home you have to climb the hill and it's awasome! Like private beach. Yes, the beach is not widely known for international tourist or domestic. One of hidden gems of Bali - Nyang Nyang Beach. So beautiful. You need to work hard to go to the beach by climbing a hill. Some work-out (LOL) but when you arrive at the shore, it is worth it. Last 2018, the beach still hidden (not much people know about this beach) its mean, you can own the beach just for you. Beautiful white sand, crystal clear water. And as a bonus there are multiple shipwrecks on the shore that so instagramable. MAKE SURE BRING YOUR SELFIE CAMERA!